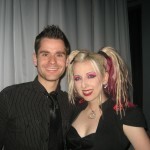 Ok, so I failed miserably at posting regular blogs for the rest of this tour, but hopefully, you guys were following along on my Ayria (FB/Twitter/MySpace status updates – yeah, they are all connected so I only have to post once! Thank God for that! 😉 ) Because I was posting short updates as much as I could. Also, Peter from Project Pitchfork was posting almost daily video reports that got funnier and funnier as the tour went on and we were all becoming one crazy tour family. If you didn’t see them on his channel the Fork Force, it’s Tour Report # 1 through 25 and is a pretty honest showing of how being on the road is. Not much glamour, long drives, but exciting nights and great shows. •	Tulsa – Amazing crowd! This is my third time playing in Tulsa and it keeps getting better and better. Which is what’s supposed to happen I guess 😉 Thanks to David 950 and crew, Suzi (Slick V 4 life) and everyone involved in that night. This was Peter’s birthday (tour report #15) and we came out onstage to bring him cake and sing Happy Birthday. He said no one had done that for him before! •	Dallas – Ah, Dallas! Possibly one of our biggest shows on the tour. The Church is such a cool venue, the backstage is bright pink, Kami & Krystal of K2 productions treated us so great, what can I say. This is the city I got the MOST pictures taken with fans. There was a Jenn line-up! (I’m blushing thinking about it). The awesome thing about Texas shows is, 1) Fans are absolutely insane and energetic, never reserved and 2) Fans follow you from city to city to go to all the shows. Seems to be a very supportive scene in Texas. Just my observations, but this is why we play 3-4 shows in this one state. That, and the fact that this state is HUGE! I <3 Texas! •	Texas continued: Austin & San Antonio were amazing shows too. Thanks to Alan & Diana & Klifford, and others (?) for following to all 3 shows! I got to eat at Koriente, my favourite little Asian Fusion restaurant a block away from the Elysium venue. •	Texas part 3 – Ate soooo much amazing Mexican food! Guacamole bowls the size of my head and loved it so much! One thing Canada does not have, and it’s great Mexican food (we have mostly everything else, I’m not knocking the T.Dot) but I love indulging in Mexican when I’m in Texas! •	San Fran – Ahhhh, I feel like this is somehow my city. I have claimed it and made it my own, ok? Thanks to: David King (fishing buddies 4 life! ), Peter (noisescape TV), Melanie Blau, Eric G., Devon, umm… plus so many more who I’m forgetting but it’s always amazing to see you guys and you always show me a great time. Thanks to all the fans that were there & who were able to tune into the live web cast (anyone? Let me know how it looked. Remember, it’s never a great representation of how a show actually sounds or looked since the mix comes right from the board (usually) and sounds weird. •	Seattle – Mikey’s hometown!! Another place that feels like home to me, as it’s where the first ever Ayria show took place and where Ayria kind of started… Stayed with my friend Michael & roomies, got to see Shaun F. (my Debris partner in crime), my friend Amy, and so many faces I hadn’t seen for far too long! •	Portland- Yeah, I know, back down south to Portland, but that’s just how the routing works sometimes! This was our FINAL show of the month long tour and we couldn’t have chosen a better spot to end it off. 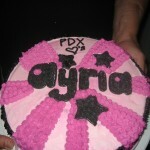 The energy of the crowd was crazy fun; my “Portland Crew” brought me an Ayria cake!!! (Picture below) yeah, that’s right, a CAKE!!!! It was so delicious. I think the word had spread about how people had brought me treats and that I love cake/cupcakes/baked goodness. And so they wanted to blow us all away with the ULTIMATE BAKED GOODS!! Much love to you guys for making us feel so special that night! Thanks to Derek, I love how getting coffee has become our tradition! •	Post Tour – We dropped everyone off at the Portland airport but I went back with Mike and Sarah to chill in Seattle for one extra day before my flight home. On the Tuesday, Sarah and I went shopping on Broadway on the Tuesday, as well as tried out a delicious place called cupcake Royale! The “Holly Hobby’s Dance Party” cup cake was the best! Then we went back because I needed time to sort out merch, repack my suitcase(s) and chill for an early morning flight home. Since being back, I always spend the first 2 days resting and getting over the sheer exhaustion of travelling and doing shows constantly. Your body reaches this level of constant adrenaline while you’re on tour that gets you through it, then when it’s done, you have no control but to crash… hard. But I’m back to normal now! Looking ahead to new music & plans. • Longest drive from one show to the next: San Antonio to Phoenix – took us 19 hours. •	Pounds gained on this tour: 5! Not bad for eating everything listed above! 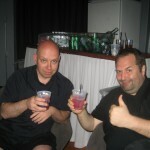 •	Drink of the tour: Vodka Cranberry! Apparently Cranberry juice is not that common or popular in Germany so they wanted to have it when they could! I wasn’t complaining! •	Number of packs of gum Kevin went through… I’d say at least 25. That boy is addicted to chewing gum! •	First tour EVER that I did NOT get sick or catch a virus of any kind! YAY! Maybe it was all the nutrients I was getting from IHOP, Denny’s, Applebee’s, cranberry juice, and the cupcakes!? I’ll never know. •	Number of times Donkey had trouble and we ended up at a garage: at least 4. But that was part of the whole adventure! •	Funniest Tour video that I’m not in video #22 Titled “The Jenn Files” look for the riveting conclusion in video #23, yeah, our videos started having real plot develop!! Hahaha! Thanks to Mike and Kevin for being live members of Ayria on this tour. You guys were awesome & I had so much fun with you both! Thanks to Project Pitchfork (Peter, Jurgen, Achim & Axxl) for inviting us to be part of this tour! We love them, miss them and had a wonderful time with them. 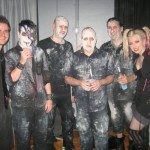 We will actually get to reunite as we are both booked to play INFEST this August on the same night as them in the UK! Complete coincidence! If you were at any of the shows, please post here! I’d love to know, and to hear your memories & stories!